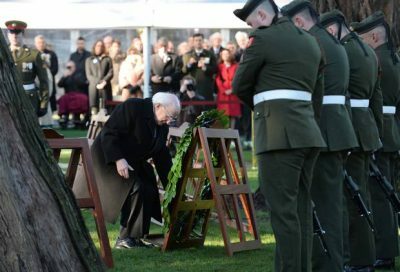 President Michael D Higgins led Ireland’s Armistice commemorations, marking one hundred years since the end of World War One and honouring the 200,000 Irish soldiers who fought in it. Thousands of people defied wind and heavy rain today to attend Armistice Day ceremonies across Ireland for the 49,000 Irish soldiers killed in World War I.
Mr Higgins lay a wreath as members of the Defence Forces held their heads down, as a mark of respect. Dignitaries from across the globe joined together at Glasnevin Cemetery, Dublin, as Victoria Cross commemorative plaques were unveiled, in memory of five fallen soldiers from Dublin, Wicklow, Sligo, Antrim and Down. Each soldier was posthumously awarded the Cross – the highest British military award for gallantry.